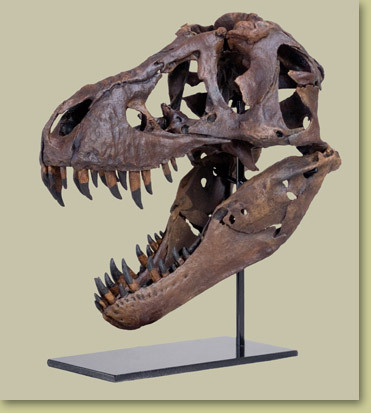 Thirty-nine individual elements (plus the brain case) were CT scanned in order to create this reproduction of the most complete and undistorted T. rex skull ever found. 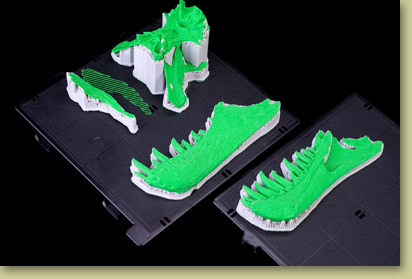 The digital data was then transferred to a 3-D rapid prototype machine that created an exact sixth scale replica. 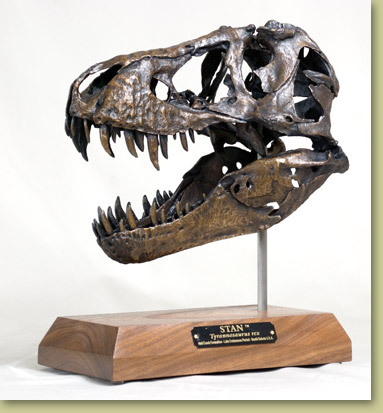 The rapid prototype bones were then molded and assembled into this complete T. rex skull cast. This skull preserves every detail including bite marks and tiny foramina from the original five foot long skull which has been reduced to a mere ten inches in length. In addition, Black Hills Institute has collaborated with Black Hills Bronze Fine Art Foundry, (almost next door to our facility in Hill City, South Dakota) to produce this exquisite specimen in bronze! Notes May take approximately 4 weeks for production of resin version or 8 weeks for production of bronze version. Check with us to see if an earlier delivery is possible.